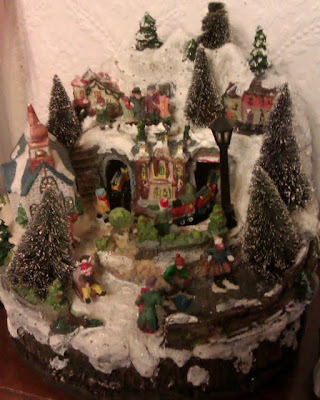 It is the season of goodwill and of course delightfully tacky decorations. Walking around a garden centre yesterday and looking at the range of Christmas decorations on sale, it struck me how many featured trains. Now this seems a little odd to me, after all we all know that Mary had to make do with a donkey, and I doubt the wise men came from the East by the Starlight Express. And as for Santa, Rudolph is a reinder not a steam locomotive. 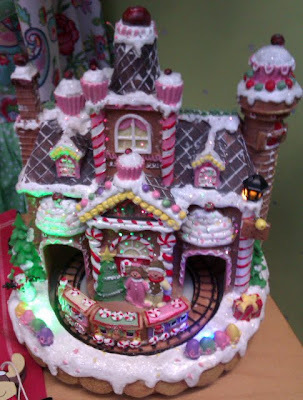 So why are there so many decorations of Santa riding a train, or trains running through a snowy village? 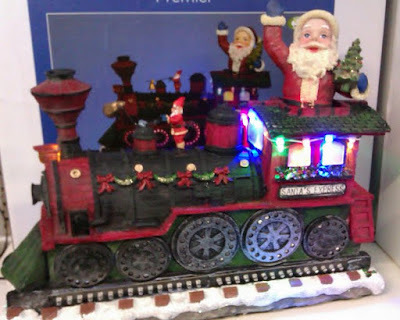 Perhaps the reason is that everyone likes a Christmas-themed train, and toy trains are associated with Christmas (at least as much as Mary Poppins and those big round tins of sweets you never seem to see the rest of the year!). I've often thought of building a proper Christmas-themed model railway as a decoration, it's been done before and 009 is an ideal scale for it, but I've built enough layouts this year so perhaps another year! May I wish all readers a happy Christmas time, and may the new year bring many happy hours of making models! When we bought the house we knew the kitchen needed replacing, but there were other more urgent priorities. Now nine years later we finally have a nice kitchen! I must point out that I didn't fit it myself - my DIY skills are nowhere near that good - but even so the installation has been disruptive. It is a kitchen-diner, which meant not just clearing out the kitchen units but my layout(s), bookshelves, and tools have been packed away for a few weeks. And that when the obvious storage space - the garage - was full of new kitchen, so the whole house seems to have been taken over with boxes. I've also been busy decorating the room, and laying the new laminate flooring. While things are gradually returning to normal there are still a number of jobs I need to do (fitting curtains and blinds, planing doors, floor joiner strips...) in addition to the usual family preparations for Christmas, so it is unlikely I'll get any modelling done until the new year. Still, after several months of intense activity on two layouts it is nice to have a bit of a break ... and plan the projects to pick up in January!